With a lifetime of experience as a volunteer and volunteer coordinator for a wide variety of programs, civilian and military. Jo Rusin knows that leading volunteers is much more challenging than leading paid employees - volunteers don't have to come to work. If they don't enjoy what they are doing or feel that they are not being treated with respect, they don't give notice. They just stop showing up, which is why mainstream leadership experience isn't enough when it comes to leading volunteers. Volunteers Wanted is a classic guide, designed for community based volunteer organizations. It is a quick read, spiced with memorable examples, that starts with the basics, but doesn't quit there. What does it cost to operate a volunteer program in terms of time and energy? How do you find and develop the volunteers you need? How do you make it easy for people to volunteer? Exactly what do you want volunteers to do? What are the best recognitions and rewards (tee-shirts and coffee mugs aren't always the best incentives)? How to deal with problem volunteers. 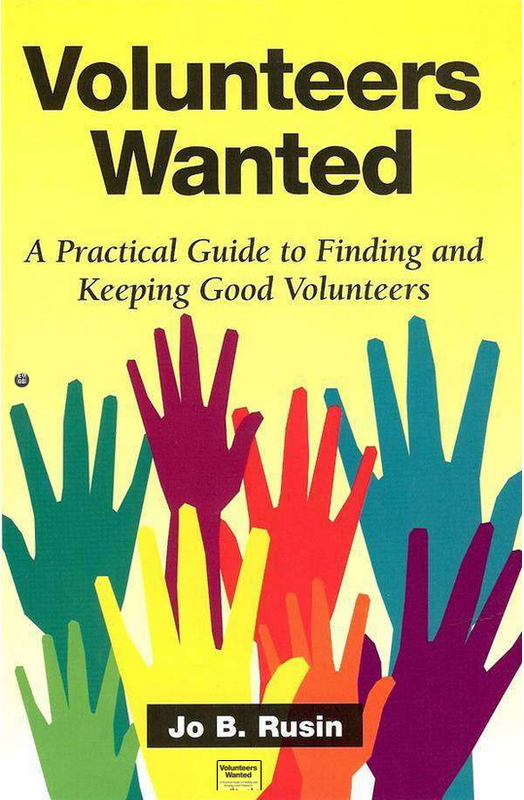 Now in its fourth printing, Volunteers Wanted has become a mainstay for volunteer programs from coast to coast, as the little book that unlocks the barriers to successful volunteer management. Not only are volunteer organizations applying its lessons, Volunteers Wanted is now being used as a university textbook. Volunteers Wanted will make you and your volunteer program a success. You don't have to learn these lessons the hard way (grit your teeth, pound your desk, and rip your hair out) to figure out how to fix the problems in your volunteer program - the answers are right here. ​FOR A FREE COPY OF VOLUNTEERS WANTED, CONTACT THE AUTHOR AT jorusin@JoRusin.com.